Enjoy a Gapless Smile from Your Cosmetic Dentist in Randolph! When you look into the mirror and see gaps between your teeth, it bothers you and makes you feel insecure about your appearance. The time has come, though, to do something about it, but what? “Will I need to wear braces?” You wonder. Your cosmetic dentist in Randolph has two simple, yet effective ways of perfecting your smile that don’t require you to wear any metal in your mouth. Learn what they are and how they work, as you read on! An example of the advancements made in dentistry is the porcelain veneers method. Custom-crafted from tooth-colored premium quality ceramic, the thin shells are applied directly to your teeth and mask slight imperfections like gaps, misalignments, crookedness and stains. Your dentist will first administer a local anesthesia to numb the teeth that will be worked on. He will then remove a thin layer of enamel from your ivories that make up the smile zone. 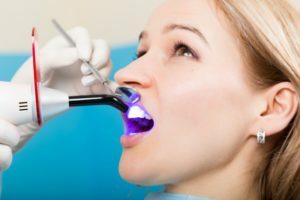 Next, the staff there will capture images of your smile and take bite impressions that will be sent to a trusted lab that will fabricate your permanent veneers. In the interim, you’ll be fitted with a set of temporary shells. When your custom veneers are ready, you’ll be invited back to your dentist’s office to have them fitted, leaving you with a beautiful new smile! For those who are more cost-sensitive, though, there is yet another method available. An alternative to the porcelain veneers method is cosmetic bonding. Your Randolph cosmetic dentist will use a compound resin material to fill in the gaps between your teeth. He’ll then shape it to fit the natural look of your other ivories and use a special light to harden the material. After a quick polish, you’ll have a completely remade smile! One of the more attractive aspects of cosmetic bonding is that the procedure can be completed in just one visit. Thus, you can save time and money. How Can You Determine Which Option is Best for You? To make an informed decision about which cosmetic method to use, visit your local dentist for a consultation. While there, you can ask any questions you may have about the procedure and learn more about which process will better suit your specific needs and the structure of your face and lips. The first step in your quest for a perfect smile is to reach out to your dentist to schedule an appointment today! Dr. Glen Goldstein earned his Doctor of Dental Medicine degree from the University of Medicine and Dentistry of New Jersey. Since then, he’s gone on to provide the Randolph area with expert care for nearly three decades. In an effort to further expand his knowledge and stay abreast of the latest changes in the world of dentistry, he pursues continuing education courses throughout the year. Dr. Goldstein offers smile-perfecting cosmetic care at Randolph Dental Care and can be reached for more information through his website. Comments Off on Enjoy a Gapless Smile from Your Cosmetic Dentist in Randolph!